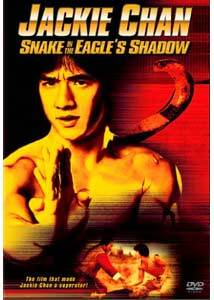 Snake in the Eagle's Shadow is arguably the first Hong Kong film to show the true genius of not only Jackie Chan, but also director/choreographer Yuen Woo-Ping. It set a standard for a lot of the work to follow, and brought back the feeling of quality earlier works in the genre had established. It's obvious that Woo-Ping worked with Chan closely here to try and create something stronger than the average kung-fu movie, and the end result is a classic film, without question. While the Woo-Ping/Chan collaboration Drunken Master (made the same year) is often considered the genesis of modern Hong Kong cinema, Snake in the Eagle's Shadow is much more deserving of that honored place. Our story is fairly typical of most kung-fu works, and is about one style of fighting (Eagle Claw) trying to wipe out another (Snake Fist). The film begins with Sheng Kuan (Jang Lee Hwang) killing off one of the last great masters of Snake Fist, so that his school, Eagle Claw, will be the most powerful. He knows there are at least 2 Snake Fist members left, so he goes on a quest to find and kill them as well. Meanwhile, at a small martial arts school, Chien Fu (Jackie Chan) cleans floors and does odd jobs while being taunted and harassed by the other school members. One day, he runs into a strange old man (Siu Tien Yuen), to whom he decides to give a temporary home at the school. While Chien Fu befriends the mysterious old beggar, he has no idea that the evil forces of the Eagle's Claw school are moving around town to find this beggar who is, in reality, one of the last masters of Snake Fist. When the man, known as Cheng-Cheh, sees how poorly Fu is treated at the school, he arms him with knowledge, and begins teaching him Snake Fist style slowly and gradually. Eventually, Fu becomes a Snake Fist master, and just in time, for his martial arts school is threatened by bullies and the Eagle's Claw masters have revealed themselves as well. In traditional, kung-fu fashion, Fu will have to take just about everyone on in order to get peace and justice. Now, one of the things many viewers will almost immediately notice about Snake in the Eagle's Shadow is how closely it mirrors Drunken Master. Siu Tien Yuen plays the exact same kind of dottering, old man character, except he isn't perpetually drunk. Grand Hong Kong film villain and comedic actor Dean Shek plays the teacher who torments Jackie Chan's character in the exact same way as his character in Drunken Master, and of course Chan himself plays a similarly goofy person. Even the sequence in which Fu is trained by Cheng-Cheh is almost exactly like the training sequence in Drunken Master. It's clear that this was where the formula was proven successful for Chan and director Yuen Woo Ping, and even all these years later it's still an amazingly strong movie. Not only is there absolutely brilliant slapstick comedy, in the true Buster Keaton vein, but the fight sequences are extremely entertaining as well. Interestingly, the level of comedy is quite high, with things being only rarely taken seriously. As a result, some of the unintentional humor in kung-fu flicks with morbidly serious plots is cleverly avoided. All in all, this is a fun package representing some of Chan's best work, as well as a classic of Hong Kong cinema in its own right. Image Transfer Review: While the age of the film obviously leads to some damage on the print as well some faded color here and there, the transfer is surprisingly good. Other than the natural problems of the print, there's little to complain about, and the problem with over-sharpening occasionally present on Columbia releases doesn't seem to be an issue here. The only thing qualifying as an annoyance is a grainy, purple-colored distortion present on the print that occasionally bubbles past every few minutes. Being anamorphically enhanced, the image also shows a nicely improved resolution over previous versions I've seen, and the slight artifacts in some of the darker scenes are only noticeable if you're really looking for them. Audio Transfer Review: Audio in these old kung-fu movies has never been their strong suit, and that hasn't changed here. The audio is mono (from a Dolby 2.0 mix), and shows signs of being badly effected by print damage and wear. There's a lot of pops, clicks, and distortions all over the place. This doesn't really effect the movie much, other than mixed musical score which sometimes feels a bit too loud and harsh. Speaking of, some of these films are known for their soundtracks that pick and nibble from other scores, and Snake in the Eagle's Shadow seems to be no different. Apart from traditional Chinese violin music, I was able to pick out a piece or two from John Barry's score to A href="showreview.php3?ID=624">You Only Live Twice and oddly out of place excerpts from Jean-Michael Jarre's album Oxygene. Extras Review: Other than some trailers for other martial arts-genre discs from Colombia, there are no additional features. While not loaded with extras, this DVD release of one grand Jackie Chan classic is a must-see for any fan of the genre. It's also in original language, and unedited or altered from the original, which is a breath of fresh air. Hopefully, this bodes well for future releases from Chan's catalog of instant, Chinese classics.